I heart pie. I really do. Especially fruit filled pies. 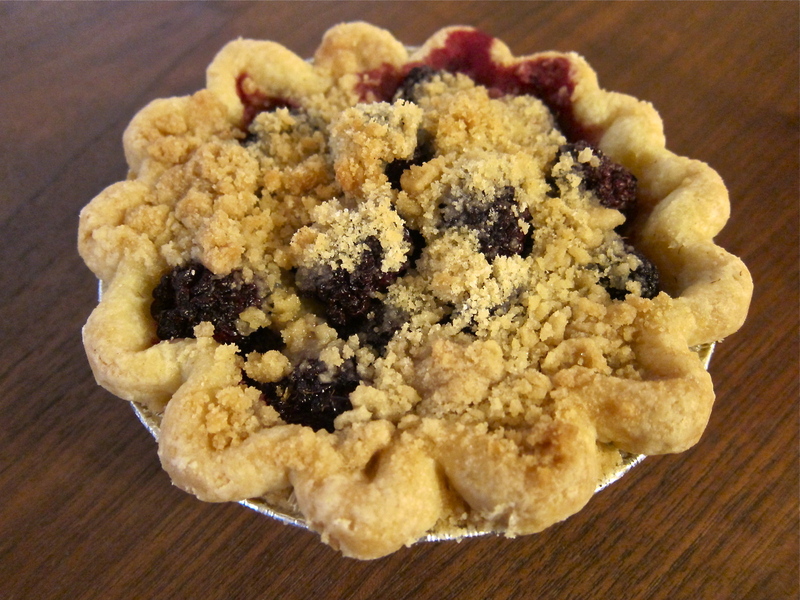 The flaky, buttery crust and the sweet, sometimes-tangy fruit buried within its walls – I heart pie. There is something sweetly nostalgic about pie. No, my mom didn’t bake pies all the time. 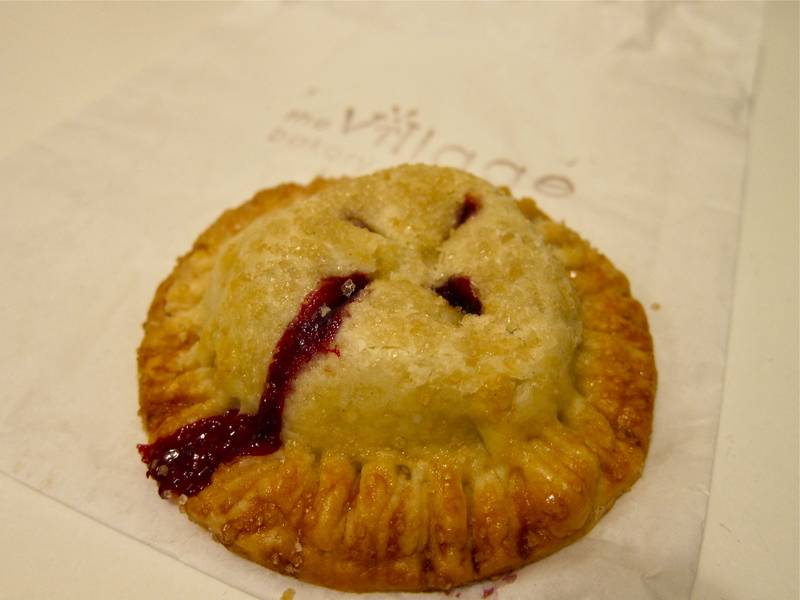 I secretly have a soft spot for pies as a result of an almost daily after-school indulgence of McDonald’s apple pies. There, I said it. The secret is out. But if any of you Angelinos out there remember, back in the late 80’s/early 90’s McDonald’s used to have a different kind of apple pie: the apple pie in the green box. It was a super-flaky pastry crust with perfectly diced and spiced apples inside. When I was younger this truly was heaven in a pie shell. So here we are today and I’m still as enamored with fruit filled pies, especially of the apple variety. Like donuts, it is hard to find a decent slice of pie in this city. House of Pies, which is in my neighborhood, offers mediocre slices that are hardly worth writing home about. Everyone waxes poetic about Apple Pan, but I thought the apple pie was pretty meh and on occasion pretty mushy. Then I discovered that my new favorite local bakery occasionally offers pie! Village Bakery is an extraordinary little gem of a café in Atwater Village. Since discovering its wide array of pastries, baked fresh daily, I have become a bit of a regular. I try to find an excuse each week (ok a couple times a week) to drop in for a maple bacon scone or a sugar paw (croissant sprinkled with cinnamon sugar and cocoa powder) or maybe a donut muffin. When I am really lucky they have one of their hand pies and even on occasion they have an individual sized fruit pie; filling varies. 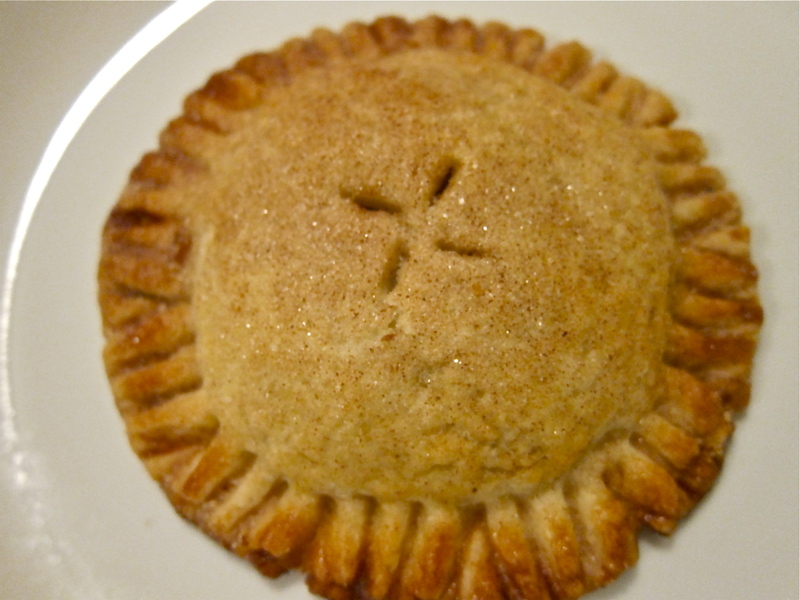 The apple hand pie is a classic apple pie in bite sized form, the perfect afternoon snach. Nice prominent notes of cinnamon and a gentle sweetness from the apples. The shell is baked just right, it crumbles delicately with each bite without being too dry or too buttery. The berry hand pie is a tart and juicy while also retaining a sweet, juicy berry burst of flavor. 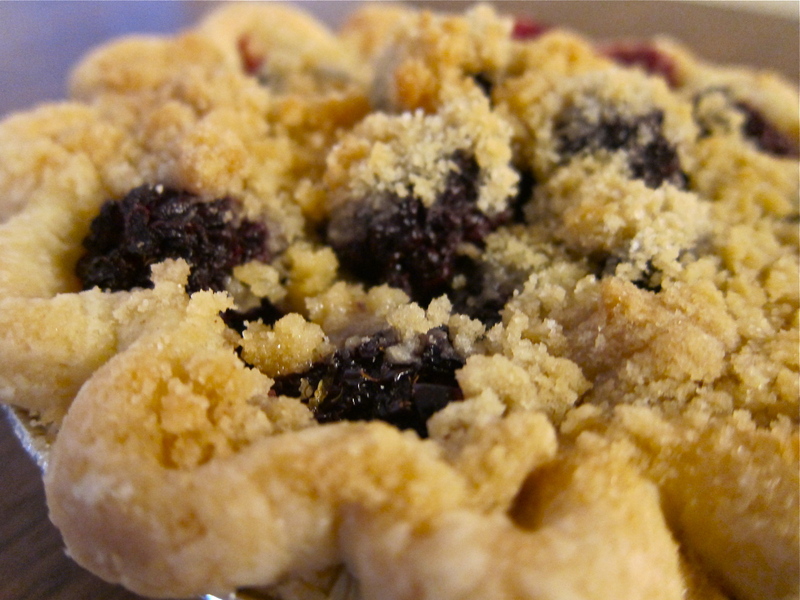 The blackberry pie is a recent addition to the ever changing roster of pastries at Village Bakery. Larger than the hand pies, this individual sized pie had a thick doughy shell that was studded with big juicy blackberries and crowned with rich butter crumbles. Each bite was delightful, subtly sweet and simply perfect. Previous PostPrevious Daily Dose of Donut! Next PostNext Size Does Matter… Pie Size That Is. Right on Los Feliz Blvd!? I never even knew this place existed must have driven past it a hundred times! apple hand pie looks like heaven in hand held form love it! I love the Village Bakery! Every sweet I’ve had there has been amazing. Best breakfast in LA! Katie – I lived in Los Feliz for 2 years before ever even stopping in now I’m hooked! Lindsey- I agree best breakfast! 🙂 i walked passed it after lunch at india sweets and spices but was too full to indulge…so basically, now i need to go and get dessert stat! haven’t tried a blackberry pie before looks good! The Village Bakery and Cafe hearts you! Lovely post—thank you & see you on Monday! Good post. I study one thing tougher on totally different blogs everyday. It’s going to at all times be stimulating to read content from different writers and follow a bit of something from their store. I’d choose to use some with the content material on my weblog whether you don’t mind. Natually I’ll give you a hyperlink on your net blog. Thanks for sharing.